But my tester wasn’t motivated by another run-of-the-mill 2.0-liter four-banger. I drove the Quadrifoglio—the one with the four-leaf clover applied to the fender—and I drove it like I stole it. How could I not? For starters, Alfa Romeo has given the Stelvio some lofty billing. It holds the —the North Loop—with a time of 7 minutes, 51.7 seconds. That time makes it as quick as a Lamborghini Gallardo LP 560-4… and the Alfa pulls off the feat with four fewer cylinders. The sprint to 60 is achieved in under 4 seconds in the Stelvio Quadrifoglio, and it’ll bend the needle until it reaches 177 mph. To put that speed in perspective, a Lamborghini Miura P400 achieved a top speed of 171 mph in 1967, and it was the fastest car on earth at the time. The Stelvio is 6 mph faster… and about $900,000 cheaper based on today’s prices for a vintage Miura P400. But all these numbers are just that… figures on a sheet meant to stir the imagination of paper racers looking for the next 1-up car. For those who are genuinely interested in a high-performance SUV as a daily driver, I attacked the highways and byways to see where the Stelvio showed promise and where it fumbled. 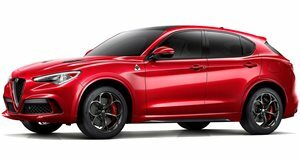 Under the hood lies the Stelvio Quadrifoglio’s beating Italian heart: a 2.9-liter twin-turbocharged V-6 engine producing a staggering 505 horsepower and 443 lb-ft of torque. From this small-displacement performance mill, the Alfa recites a raucous number that rivals the Jimi Hendrix’s guitar solo in All Along The Watchtower. In its tamest drive mode, the Stelvio Quadrifoglio purrs like a newborn kitten, but clicking the DNA selector over to Race gives it a serious roar. At full trot, it won’t be mistaken for anything but a Quadrifoglio, and it emits the most delectable off-throttle overrun (the burble you hear when you let off the gas). The Stelvio Quadrifoglio makes full use of all the power on tap, too. Sending power to all four wheels is an eight-speed automatic and Alfa Romeo’s standard Q4 all-wheel-drive system.